Wahoo is breaking the GPS bike computer stereotype! The Wahoo ELEMNT GPS Bike Computer is Equipped with Bluetooth Smart and ANT+ dual-band technology, ELEMNT pairs seamlessly with all of your cycling sensors. No more confusing menus! ELEMNT comes with a free companion app that allows you to set up your data fields, customize profiles, track performance, and share ride data effortlessly. Featuring programmable LED QuickLook Indicators to provide a quick way to see if you're on pace with important performance metrics like speed, cadence and power. A large DayBright, high resolution Display gives you clear display in all types of conditions and ELEMNT can go the distance with enough battery life for a week's worth of epic rides. And with free pre-loaded maps from around the world, it's great to just get up and go without planning a route. The ELEMNT fully integrates with Pioneer’s Pedaling Monitor Power Meter to show you precise dual leg power measurement and pedaling efficiency. The ELEMNT graphically displays real time pedaling data and Pedaling Efficiency metrics to help you identify pedaling technique, develop pedaling balance and minimize power loss on the bike. Simple to set up, simple to experience, simple to stay connected, simple to navigate, and simple to suffer - the ELEMNT GPS Bike Computer gives you the POWER you demand with the SIMPLICITY you expect! 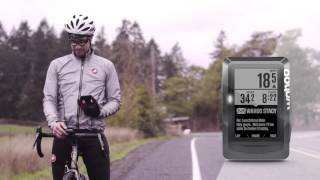 Experience the game changing power of the wireless ELEMNT GPS Bike Computer, you'll never go back. Check out the ELEMNT GPS Bike Computer Instructions here.